When buying pigs, even though you learn their history from the breeder, you can never be certain they don't have internal parasites. If left untreated, internal parasites can lead to dangerous diarrhea, dehydration, liver and kidney destruction, skin lesions and more. Deworming before parasites perform permanent damage is essential to maintaining the long-term health of your swine. If you are not sure whether your pigs are infested with internal parasites, contacting your veterinarian to obtain a diagnosis is essential. Measure out some dewormer according to the instructions on the package for the number of pigs you intend to treat. One pound of powdered deworming treatment provides four days worth of treatment for 20 pigs. You may need to adjust the treatment to suit the needs of your swine. Spread the measured deworming powder over your pigs feed, then feed your pigs as you normally would. Repeat the procedure over the next three to four days, adding the recommended dosage to their feed. Clean and disinfect pig storage pens and maintain their cleanliness to prevent re-infestation. Because parasites thrive in cool, moist soil, allow the sun to dry out mud holes. Then, try to keep those areas dried out. 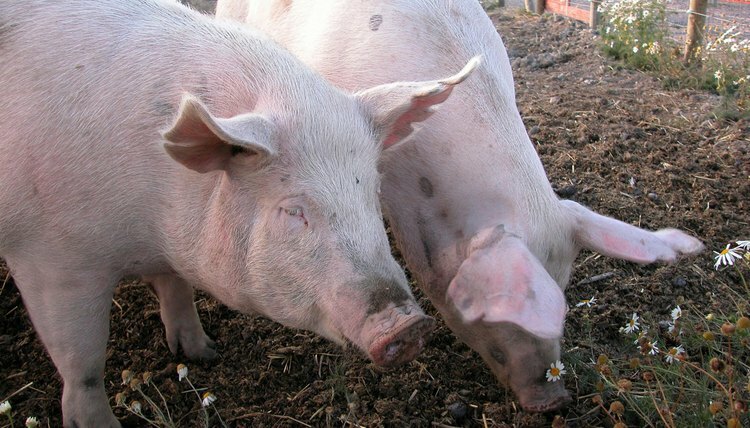 Continue to administer deworming treatments once a month to keep your pigs healthy. Directions among deworming treatments may vary. Be sure to read all instructions thoroughly before treating your pigs to avoid accidental dosage .